To purchase any of these books with a check or money order or through PayPal, please click here. 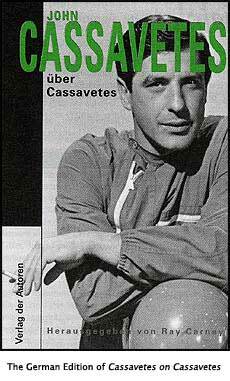 Cassavetes on Cassavetes is the autobiography John Cassavetes never lived to write. It tells an extraordinary saga – thirty years of film history, chronicling the rise of the American independent movement – as it was lived by one of its pioneers and one of the most important artists in the history of the medium. 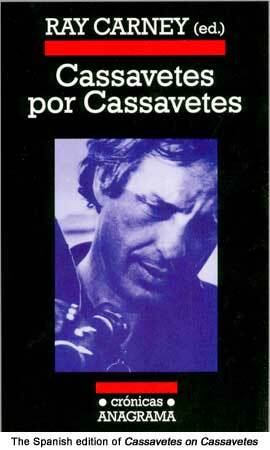 The struggles, the triumphs, the crazy dreams and frustrations are all here, told in Cassavetes' own words. Cassavetes on Cassavetes tells the day-by-day story of the making of some of the greatest and most original works of American film. 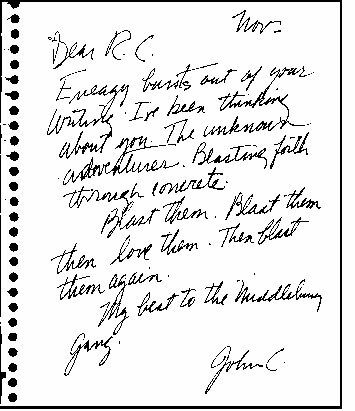 —from the "Introduction: John Cassavetes in His Own Words"
To read reviews and critical responses to Ray Carney's Cassavetes on Cassavetes, please click here. 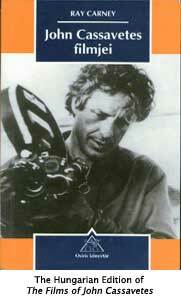 For reviews and critical responses to The Films of John Cassavetes, please click here. This book is available through Amazon, Barnes and Noble, your local bookseller, or, for a limited time, directly from the author (in discounted, specially autographed editions). See below for information how to order this book directly from the author by money order, check, or credit card. 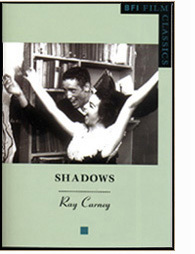 Ray Carney, Shadows (BFI Film Classics, ISBN: 0-85170-835-8), 88 pages. This book is available directly from the author via this web site for $20. This book is available through Amazon, Barnes and Noble, and in England through Amazon (UK) and The British Film Institute. For a limited time, the Shadows book is also available directly from the author (in discounted, specially autographed editions) via this web site. See information below on how to order this book directly from the author by money order, check, or credit card (PayPal). This is the first book-length study ever devoted to this controversial and iconoclastic filmmaker. It is the argument of American Dreaming that Cassavetes has single-handedly produced the most stunningly original and important body of work in contemporary film. Raymond Carney examines Cassavetes’ life and work in detail, traces his break with Hollywood, and analyzes the cultural and bureaucratic forces that drove him to embark on his maverick career. 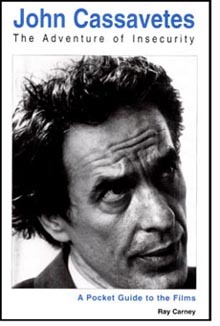 Cassavetes' work is considered in the context of other twentieth-century forms of traditional and avant-garde expression and is provocatively contrasted with the better-known work of other American and European filmmakers. 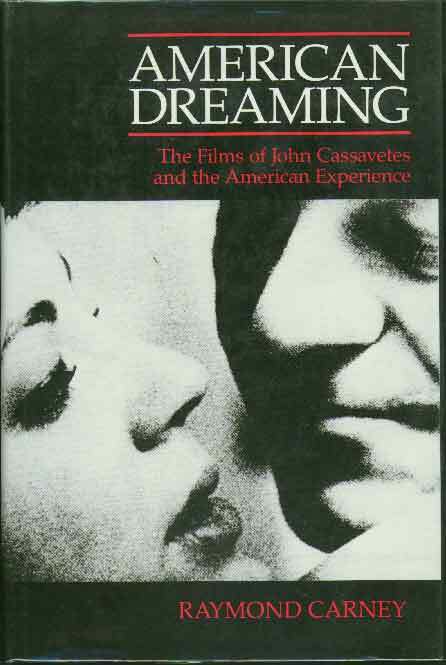 For reviews and critical responses to Ray Carney's American Dreaming: The Films of John Cassavetes, please click here. 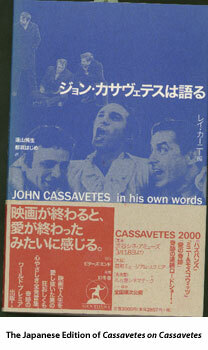 This was the first book ever written about Cassavetes' life and work in any language, and has long been out of print but is now newly available through this web site for $20 in a Xerox of the original edition. You may order with a credit card through PayPal or through the mail with a money order. See below. 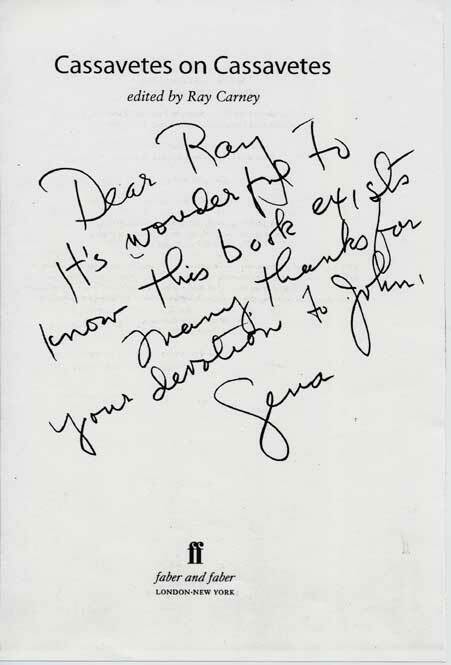 In addition, two packets of Ray Carney's writings on John Cassavetes (material not included in any of the above books) are also specially available through this web site. 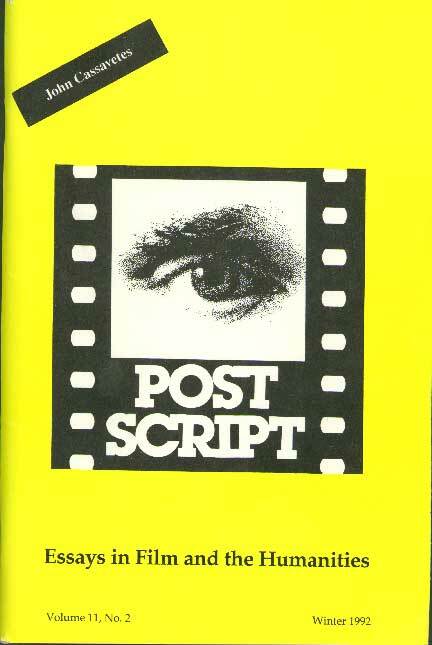 These packets contain the texts of many of his notes and essays about the filmmaker. Each packet is available for $15.00. 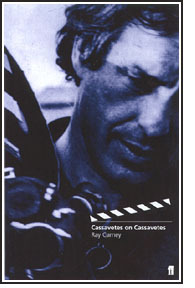 Three packets of interviews with Ray Carney are available exclusively through www.Cassavetes.com. They are not for sale in any store and only available through this web site. Ray Carney, Why Art Matters: A collection of essays, interviews, and lectures on life and art, softbound, approximately 150 pages (60,000 words). Available for $15. A collection of essays, interviews, and lectures on art, life, and film that appeared in Visions and Moviemaker magazines between 1993 and 1999. The collection includes the celebrated “The Rules of the Game,” “Fake Independence and Real Truth,” “The Path of the Artist,” and many additional pieces. This packet reprints the complete texts of many items that are published only in excerpts on Ray Carney’s site. Ray Carney, Necessary Experiences—What art can show us about ourselves and our culture, softbound, approximately 170 pages (60,000 words). Available for $15. A collection of essays and interviews on art, life, and independent film that appeared in Filmmaker, Moviemaker, The Daily Telegraph, and other places between 1999 and 2002. Ray Carney talks with Jim McKay, Cynthia Rockwell, Jake Mahaffy, and others about his impressions of Cassavetes the man, and about the lessons he learned while working on his Cassavetes on Cassavetes and Shadows books. He talks with Shelley Friedman about independent filmmaking and the importance of making a life when making a career. This packet reprints the complete texts of many items that are published only in excerpts on Ray Carney’s web site. Ray Carney, What's Wrong with Film Books, Film Courses, and Film Reviewing—And How to Do It Right, softbound, approximately 190 pages (80,000 words). Available for $15. A book-length interview in which Ray Carney talks about his experiences as a classroom teacher, his views of the American media and film reviewing system, and his experiences in the world of publishing. The complete interview will be published in two parts. Part one is now available. Check back for the availability of part two in the near future. This packet reprints the complete texts of many items that are published only in excerpts on Ray Carney’s web site. An impressive cast of scholars examines works and their creators across the whole spectrum of artistic expressionfiction and poetry, painting and sculpture, architecture, dance, photography, and film. In fresh and provocative essays they explore how the ideas of modernism helped shape such artistic expressions as the writings of the Harlem Renaissance, the paintings of Edward Hopper, New Deal public art projects, and George Antheil's Ballet Mecanique. Extensive use of color and black-and-white illustrations results in a book that is as appealing visually as it is stimulating intellectually. Available through Amazon, Barnes and Noble, your local bookseller, or, for a limited time, directly from the author (in discounted, specially autographed editions). See below for information how to order this book directly from the author by money order, check, or credit card. Clicking on the above links will open a new window in your browser. You may return to this page by closing that window or by clicking on the window for this page again. Ray Carney's The Films of Mike Leigh is quite simply the best book of film criticism I have ever read. Now I have to say that I have never read any of Carney's other books (he has also written books on Cassavetes, Frank Capra, and Carl Dreyer), which, for all I know, might be even better. But as a friend of mine put it, 'His writing blows everything else out there away, even to the point of many times seeming like simply in a class of his own...different in kind more than degree.' And although I admit to not having read 'everything else out there,' I feel the exact same way. Ray Carney's new book has undeniably rocked my world. Ray Carney's book is to what usually passes for film criticism what Mike Leigh's movies are to what, in Hollywood, usually passes for filmmaking: a truly radical critique, a whole different animal, and a solitary voice of sanity that has somehow miraculously managed to make itself heard over the noise and hullabaloo of this culture's present-day insanity. Ray Carney, The Films of Mike Leigh: Embracing the World (New York and Cambridge: Cambridge University Press, 2000), 13 illustrations, paperback, 290 pages. This book is available directly from the author for $20. Mike Leigh is a maverick British independent who, for nearly 30 years, has been producing eccentric, unique, and almost uncategorizable works. Though his career dates back to 1971, with a film called Bleak Moments, Leigh has worked in obscurity for most of that time, coming to the attention of an international audience only with his recent productions of Naked, Secrets and Lies, Career Girls, and Topsy Turvy. Working in a similar way to that of Robert Altman, John Cassavetes, and Tom Noonan, Leigh begins with a small group of actors around whom he builds his films during months of private rehearsal. There is no script at the start. It is written as he goes along. The films--which include Abigails Party, Meantime, Home Sweet Home, High Hopes, and Life is Sweet--are brilliant, outrageous, iconoclastic--and hilarious. Leigh's work has been both ridiculed by some and celebrated by others as among the greatest filmmaking of the twentieth century. This study argues, among other things, that part of the misunderstanding of Leigh's work has been the result of misclassifying him as a British "realist" in the tradition of Osborne and Loach, when in fact his films are far stranger and more artistically daring. The Films of Mike Leigh: Embracing the World makes the case for regarding Leigh as one of the great artists of the century. This is the first comprehensive critical appreciation of Leigh's work ever written, and it offers insights not only into this unusual filmmaker's strange and often baffling movies, but into film itself as a way of knowing and understanding the world. This book offers nothing less than a radically new way of understanding both life and art. 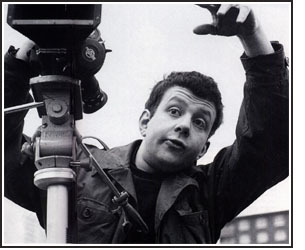 To read reviews and critical responses to Ray Carney's The Films of Mike Leigh, click here. The first interdisciplinary study of America's best-known filmmaker. 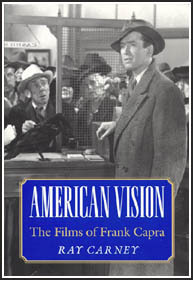 In this daring and unorthodox study, Ray Carney places the work of Frank Capra in the great tradition of American transcendentalism--along with paintings by Homer, Eakins, Sargent, Hopper and the writings of Emerson, Poe, Hawthorne, and William and Henry James, among others. Interweaving wide-ranging discussions of American literature, drama, and painting and the work of other filmmakers with detailed analyses of such films as Its a Wonderful Life, Meet John Doe, and Mr. Smith Goes to Washington, Carney finds in Capras life and work a classic American struggle for self-expression within the repressive structures of ordinary life. In this larger cultural context, Capra emerges as something far more radical than the social realist he is often taken to be--as a visionary determined to unleash "mysterious, distinctive, personal energies that defy social understandings or control." This book is available through Amazon, Barnes and Noble , your local bookseller, or, for a limited time, directly from the author (in discounted and specially autographed editions). See below for information how to order this book directly from the author by money order, check, or credit card. Clicking on the above links will open a new window in your browser. You may return to this page by closing that window or by clicking on the window for this page again. If you order directly from the author, also included will be a copy of Ray Carney's "Learning from Dreyer: Reflections on the Lessons His Work Teaches," which originally appeared in Lene Crone and Lars Movin, eds. 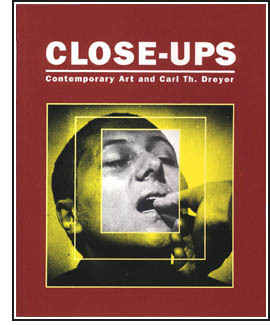 Close-Ups: Contemporary Art and Carl Th. Dreyer, Nikolaj, Copenhagen Contemporary Art Center (Copenhagen, Denmark, November-December 1999). Although Carl Dreyer is universally acknowledged to be one of the supreme masters of world cinema, it is one of the oddities of film history that beyond The Passion of Joan of Arc, his films have seldom had the general recognition that they undeniably deserve. 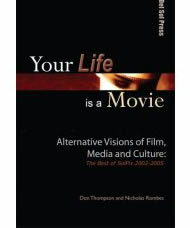 This book is an attempt to bring his work to the awareness of contemporary filmgoers everywhere. Ray Carney argues that the key to an understanding of Dreyers work is to be found in an appreciation of his distinctive style. Professor Carney argues that Dreyers style creates a "radically new way of knowing and feeling" that can change how we understand our experiences and identities outside of the movies. Following a general consideration of Dreyers style, the book offers lucid and comprehensive interpretations of the three crowning masterworks of Dreyers career: Day of Wrath, Ordet, and Gertrud. The study will appeal both to general filmgoers and to undergraduate and graduate students interested in film. 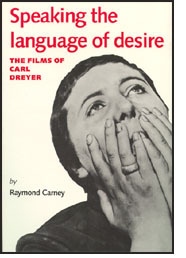 Click here to read reviews and appreciations of Ray Carney’s Speaking the Language of Desire. This book is available through Amazon, your local bookseller, or, for a limited time, directly from the author (in discounted and specially autographed editions). Lisa Philips, ed. Beat Culture and the New America1950-1965 (Paris and New York: The Whitney Museum of Art in association with Flammarion, 1995) softcover, copiously illustrated with more than 300 photos, 280 pages. 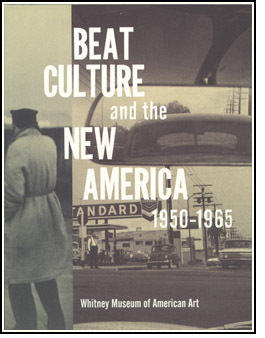 Beat Culture and The New America: 1950-1965 puts the cultural legacy of the Beat generation into the context of the social and artistic ferment of the 1950s and early 1960s. This, the catalogue that accompanies the show at the Whitney Museum, surveys a vast range of artistic practices--from painting, sculpture, photography, to film, and a fascinating range of documents and Beat ephemera. The book goes far beyond defining what Beat was and was not, what it spawned or what it ignored. Whitney curator Lisa Phillips, who conceived and organized the exhibition, and the nine contributing writers to this catalogue [which includes three new pieces by Beat film expert Ray Carney] have set out to define not only the historical roots of Beat culture, but also the relationship between its fuzzy edges and its molten center. Just as important, the show and catalogue clarify the bridge between the current range and tone of American art, music, and literature and the residual forces which initially emerged during this complex moment in postwar American history and remain very much with us today. A book containing interviews with: Ray Carney, Rob Nilsson, and Kayoko Mitsumatsu, and essays by: Todd Gitlin, Timothy Dugdale, Patricia Ducey, Nicholas Rombes, Eric Alterman, Don Thompson, Mike Shen, T. B. Meek, and Michael Neff. 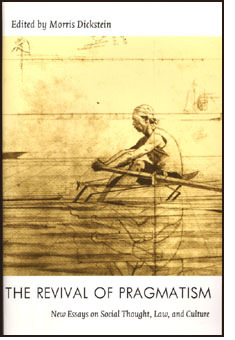 This book contains one of the longest, most detailed, and far-ranging interviews Prof. Carney has ever given. 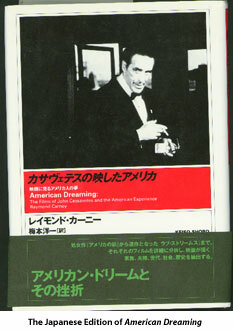 Ray Carney's book-length interview with Shelley Friedman, which took place over a period of weeks and runs almost 30,000 words, covers a range of topics--from problems with journalistic film reviewing, to how the worship of money, power, and celebrity in America distorts film appreciation, to the function of film festivals, to the deficiencies of academic film study and the purpose of film school. Professor Carney also gives his views on influential recent filmmakers like Quentin Tarantino, Wes Anderson, David Lynch, Neil LaBute, Andrew Bujalski, and Caveh Zahedi. This book may be obtained at Amazon by clicking here, or special ordered at any bookstore.And note that the entire text of this interview is also included in Prof. Carney's "Necessary Experiences" packet, which is for sale on this page. Click here to go there.